Taking Flight: Education Department Updates. The last month has been full of action for the education department. I was able to kick it off with one of my favorite things, a Wisconsin Association for Environmental Education Conference. The WAEE fall conference is truly a highlight of my year. It is such a great opportunity to network with other professionals in the EE field, visit with friends old and new, see what is happening in the field and get energized with ideas. This years conference was located at Upham Woods (a UWEX camp) in Wisconsin Dells. The Dells area is so often thought of as a tourist trap, but if you step just a short way off the main drag you get to see some beautiful things. One of the great sessions was a nature awareness session led by an educator who uses survival skills to get people involved while learning. One of my favorite parts about going to an environmental education conference is that you don't have to spend the entire time in a meeting/conference room. You get to go out in the field and learn in the same way that we strive to teach. I also had the chance to get a glimpse at a project that we are excited about. The DC Everest School Forest has partnered with REGI through the years to teach about owls to their students. They are working on a beautiful interactive exhibit that will include an amphitheater for REGI to teach in when it is finished. You can view some of the progress on the artists website by following this link. While I was in the area I decided to check out another amazing place just a hop, skip and a jump away from the Dells, The International Crane Foundation. 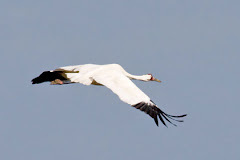 It was my first experience getting that close the beautiful and rare Whooping Cranes. As a former early childhood teacher I always enjoy an opportunity to work with pre-school age children. Last week I took a few birds to the Busy Bee Child Care center in Antigo. The look of amazement on the children's faces when they get to see a bird close up always brightens my day. They could not get enough of Lil' Bit, the saw-whet owl, but then again... who can. Karissa, who spent the summer interning with us, has begun to help out part time with education. We traveled to Rhinelander on last Thursday to do a program on owls for a family event. After the live bird program we did bird education activities with the children and families. The children were very wrapped up in the education stations that we had set up on tables. They learned about wingspans, birds sense of smell and got a chance to use binoculars. Nicolet College in Rhinelander is a beautiful campus located on the shores of Lake Julia and the staff and families where a pleasure to work with. It was one of two Rhinelander programs in the last week. We have been keeping ourselves busy. Now that summer tours have wrapped up we had a short lull and now we are off and running again with school programming!